Want a unique stress toy? Why not try the wobbling man? Aside from being soft and squeezy, the weighted end ensures that the toy constantly bounces back into an upright position, much like those inflatable punching bag toys. With its ability to bob about and move, the wobbling man is far more dynamic than your usual stress toys and makes for a memorable giveaway. Brand it with your logo for an amusing and fun promotional product that's sure to be a hit amongst the young and the young at heart. 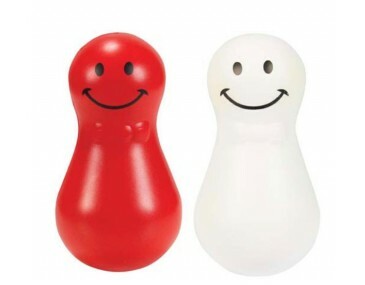 Brightly coloured and featuring a cheerful smile, these wobbling men are our most amusing stress toys yet. Free standing, soft, and smoothly textured, they make for excellent stress relievers and decorations. Squeeze them, spin them, or knock them about, the wobbling man bounces back into position each time. And unlike regular stress balls, you don't have to worry about these rolling away. These are an excellent addition to any workspace. Our prices include a 1 colour, 1 position pad print of your design on the bottom half. Please note that our prices are ex-gst, and a print set up fee of $75 applies. These products are supplied in bulk quantities. Production time is two weeks, but speak to us if you need them more urgently. Printing space is 25x 20 mm.